Welcome to the website for the choir of St Luke's Church, Chelsea. Here you will be able to find out more information about the church, choir, music and how to join the choir. St Luke's is one of the few London churches that has a choir consisting entirely of talented volunteer singers. It is hard to find another choir performing a wide liturgical repertoire on a regular basis to such a high standard. We sing in the Parish Eucharist and Choral Evensong every Sunday and at various major church festivals throughout the year, as well as taking part in cathedral tours and concerts. The choir at St Luke's is a young and friendly group, who put just as much enthusiasm into socialising as singing! 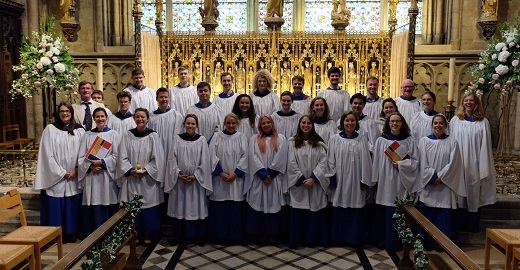 We are the perfect choice for anyone who has sung in cathedral or chapel choirs at university and wishes to continue singing to a high standard when they leave and move to London. We regularly recruit for all voice parts. Choral scholarships are also available. Please see our page on joining the choir for more information. You can find out more information about the parish of St Luke's & Christchurch, Chelsea on the Parish homepage.